The comet has since become known as Lexell's Comet, after the Russian (yet Swedish born) astronomer Anders Johan Lexell who first calculated its orbit. He showed that the comet had made a close approach of just 2.2 million kilometers (0.015 AU), which is about six times the distance to the moon. It was the closest a comet has ever been witnessed to approach the Earth and, in astronomical terms, a very near (and fortunate) miss. Lexell found that the comet swooped around the sun with an orbital period of just under six years, but its next return in 1776 would see it on the far side of the sun, out of harm's way. Sure enough, no astronomers found it again that year. In 1782 however, when again it was predicted to be visible, the comet was nowhere in sight. The French mathematician Pierre Simon-Laplace calculated that the comet had experienced a set of encounters with the giant planet Jupiter. The first saw Jupiter's gravity modify the comet's orbit to fling it almost onto a direct collision course with Earth. The second encounter modified the comet's orbit, ejecting it from the solar system altogether and removing it as a potential hazard. The story of Lexell's Comet was pretty much forgotten in the decades and centuries that followed. By the 1960s astronomers looked upon long period comets – comets that hail from the Oort Cloud at the very edge of our solar system and which take many millennia to orbit the sun – as the major impact hazard to Earth. A general idea developed, bolstered by computer simulations performed in 1994 by the late George Wetherill of the Carnegie Institution, that dictated how Jupiter acted as Earth's protector, sweeping up or ejecting many of the long period comets from the solar system and removing them from the population of potential impactors (Wetherill's simulations coincided with comet Shoemaker–Levy 9 colliding with Jupiter). This idea has taken hold in established theory yet few have ever really questioned it until now. Realizing that today we know of many more short period comets and near-Earth asteroids that cross our planet's orbit than long period comets, Jonathan Horner of the University of New South Wales, Sydney and Barrie Jones of the UK's Open University have run new simulations that reveal a very different picture, one that has important consequences for the habitability of Earth and planets in general. "When George Wetherill did his work back in 1994, the computers available to him were much more limited than what we have today," says Horner, who originally comes from the U.K. "The lack of computing power meant that he had to make some fairly big approximations and simplifications. His was a ground-breaking study but at the same time it was one that was limited by what he had available." While most asteroids move on stable orbits around the sun, neighboring Jupiter's influence looms large and gravitational resonances between the planet and regions of the Asteroid Belt are adept at clearing out any rogue asteroids in these regions and sending them hurtling in-system. Often these rogues can originate from collisions between asteroids that send a shower of rocky chunks spinning off into these resonant zones. "The main thing that is driving material from the Asteroid Belt into the inner solar system is the influence of something called a secular resonance," says Horner. "As things stand now in our solar system, this particular secular resonance is right at the inner edge of the asteroid belt." In their simulations Horner and Jones played about with the mass of Jupiter, finding that the lower the planet's mass, the broader the secular resonance becomes and the more it moves into the main body of the Asteroid Belt, closer to Jupiter, leading to more asteroids being perturbed. The simulations showed that the number of asteroid impacts on Earth peaks when there is a planet in Jupiter's orbit that has a mass one-fifth that of Jupiter's mass, whereas just over half the peak rate of impacts occur when there is a planet with a mass equal to Jupiter. The impact rate falls off again at the lower extreme, when Jupiter's mass becomes too low to be able to nudge any asteroids with its gravity. A similar result, albeit for different reasons, arises when considering the impact rate of short period comets on Earth. Currently, Jupiter's gravity is capable of throwing comets close to the Earth, as we saw with Lexell's Comet, but it is also equally adept at cleaning up its mess and removing dangerous comets from the solar system. Were Jupiter only to have one-fifth of its real mass, the balance between hurling comets towards us and then removing them would be lost; Jupiter would still be able to destabilize comets and send them our way, but it would lose the ability to remove many of them. 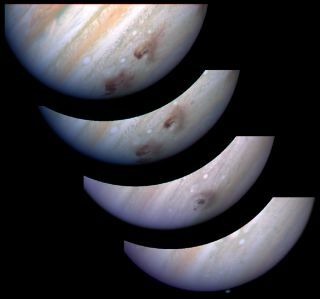 "If you have a low mass Jupiter, it is capable of placing things on Earth-crossing orbits but because it doesn't have a big gravitational reach, once it has put a comet on an Earth-crossing orbit the comet can remain in that orbit for a very long time before it encounters Jupiter again," says Horner. Jupiter's role seems confused. It definitely sends asteroids and comets our way and, in any given year, more than 90 percent of all objects crossing Earth's orbit are asteroids, so the protection Jupiter provides us from long period comets, or by eventually removing short period comets, is of lesser importance. Hence Jupiter is not the friend that it has been perceived to be. However, things could be far worse: were Jupiter to have a mere 20 percent of its mass, the impact rate would skyrocket. Obviously for any denizens on a planet in the target zone this is bad news, but in the grand scheme of things are impacts a positive or negative factor on the overall evolution of life on a planet across billions of years? When searching for potentially habitable exoplanets, should we seek to avoid systems that contain a 0.2 Jupiter-mass gas giant at a similar distance to Jupiter from the sun? Whether impacts have been a good thing or a bad thing for the evolution of life on Earth depends on who you talk to, says Dave Waltham, Head of the Earth Sciences Department at Royal Holloway, University of London. "What you can definitely say is that they cause some mass extinctions. Lots of people argue, however, that impacts can be good because they stir thing up and stop the biosphere from becoming stuck in a rut. Certainly for human beings, we wouldn't be here if the dinosaurs hadn't been wiped out." Impacts may only be healthy in the long run if they are not so frequent as to not give the biosphere chance to recover. Evidence in Earth's geological record suggests that it takes around ten million years following a big impact for the planet to heal, so an impact rate of one large collision every hundred million years or so, as Earth experiences, allows plenty of time between crashes for life to flourish. On the other hand if that impact rate was every few million years, the bombardment would pulverize our planet into a lifeless husk with little opportunity to develop a new biosphere. Horner and Jones' simulations are now beginning to feed into discussions regarding habitability on planets around other stars. "In Peter Ward and Donald Brownlee's book Rare Earth, they set Jupiter up as a shield, but they didn't really demonstrate it," says Waltham, a self-confessed 'Rare Earther'. "Jonti (Jonathan Horner) and Barrie went out and tested that idea and in doing so removed one of the barriers to habitability." The idea is that the water was brought here by objects that crashed into Earth, which were either asteroids or comets (the current consensus is leaning towards asteroids, based upon the discovery that the isotopes of hydrogen in Earth's water do not match the isotopes of hydrogen seen in comets). One can imagine that in an environment with too few impacts Earth would have remained as dry as the moon, and so a perturbing body like Jupiter might therefore be needed to ensure there is water present for life. On the flip-side, too many impacts could easily bring too much water. "Earth's water is ample and there is a lot more than we would expect given where Earth formed, but you could imagine a scenario where you have a hundred or a thousand times more water and there is no solid land," says Horner. The prospects for habitability on water worlds may be surprisingly dire, adds Waltham. "Having too much water could be a problem because Earth's climate system is, to a considerable extent, controlled by the fact that we have a mix of land and sea," he says, referring to the carbon-silicate cycle, the process by which carbon and hence global warming and atmospheric temperatures are regulated. Volcanoes spew carbon dioxide into the atmosphere, which helps warm the planet, and when the climate grows too warm rain levels increase and the carbon dioxide is washed out in a slightly acidic precipitation that weathers rocks on the surface, creating calcium carbonate, bicarbonate and silica that runs-off into the oceans. Here it becomes incorporated into sea-dwelling micro-organisms that die and carry the carbon down to the sea floor, where it enters subduction zones and is eventually recycled and spewed out once more from volcanoes. Without land, the silicate weathering cannot take place, causing a fatal break in the chain. Whereas Waltham believes Earth-like planets are rare, Horner is more the optimist and recognizes that his work with Barrie Jones has removed one of the obstacles to long-term habitability and may help act as a pointer in where to search for life in the Universe. "We'll soon go from the stage of knowing no other planets like Earth to knowing hundreds of them, and people want to look for life," he says. "The problem is it is very difficult and time-consuming to search, so you'll only be able to look at one or two and you need to have some way of saying which are the best and worst prospects. I don't think it will be a clear cut 'this will be habitable, this won't be habitable', I think it will be 'this is a bit more habitable, this is a bit less habitable' and impacts are certainly one of the important factors." From alien life to human life, impacts have a large influence. In the knowledge that Jupiter is far from being our savior and that the asteroid that finished off the dinosaurs may not merely have been one that slipped through the net, programs such as NASA's Spaceguard survey that seek out potentially hazardous objects are all the more vital. We must thank impacts for bringing water to Earth and paving the way for humans to evolve, but we must also never, ever stop watching the skies.